Previous Clubs: Celtic, FC Groningen, Willem II. Trophies Won: Scottish Premier League 2015/16. Virgil van Dijk is one of the more in-demand centre backs around, with a large number of top clubs interested in acquiring his services. With Southampton not looking to sell, the Dutch defender has tried everything short of going on strike to get a move away. With that in mind, it is near impossible to judge his performances this season, which is lucky for him as he has been poor, so I will talk about how he played prior to the injury he suffered last season. Physically he is an absolute monster of a man, who seems to be physically bigger than the rest of the players. When you see him in a line up before a match or marking someone at a setpiece on TV, he looks like the perspective is wrong, because he seems to dwarf those around him. It is not the Peter Crouch/Per Mertesacker stretched out size, but like it is a computer game and he has been rendered at a different scale from those around him. Unlike many with a larger frame, van Dijk has pace, he eats up the ground as he runs. He is one of the quicker centre halves around, which makes him very well suited to playing with a high line. He is also good in the air and strong as an ox. In fact he is probably close to the ideal physically that most football managers would like their defenders to be. Technically he is very good as well, cool, calm and composed on the ball with a decent passing range for a defender and a willingness to bring the ball out of defence. There are no worries about his first touch or technique at all, he has the technical attributes needed to be a world class defender, especially when paired with his physical attributes. It is the mental side of the game that he falls down on. 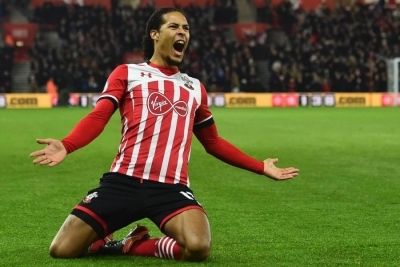 While that calm, composed style is extremely useful at times, it pervades everything he does and seems to be engrained within van Dijk's psyche to the point where he is so laid back he almost falls over. I would go so far as to call him a stroller, who, due to his physical and technical excellence, finds the game so easy he no longer tries. When van Dijk makes a forward run with the ball, he strolls back with no sign of urgency. Positionally that strolling affects him, as he gets caught out a lot and never bursts a gut to get back into position. I have lost count of the times since he joined Saints that I saw him stood well out of position, a complete passenger, as the opposing team slots the ball home. If the opposition move him around, he is not going to break his neck getting back into place. The best example of that I have seen, which told a story, was yesterday's match with Newcastle United. After 30 minutes his partner at the back, Maya Yoshida, was dripping with sweat, plastered to him where he had chased around everywhere, while van Dijk's shirt looked fresh and new without a sign of sweat. Due to the lack of urgency he displays, when teams move the ball quickly around, he is left wanting, as his unhurried style leaves him looking lost. Van Dijk is slow to respond and is often just a passenger as he cannot sort out his positioning quickly enough. Give him a big man to mark and van Dijk can handle him, outmuscling him and smother the attacker. A small pacey striker he can match for pace and lock them out of the game. Make van Dijk have to think by instead using quick passing and movement and he is caught out, van Dijk cannot react fast enough to get himself into good positions.